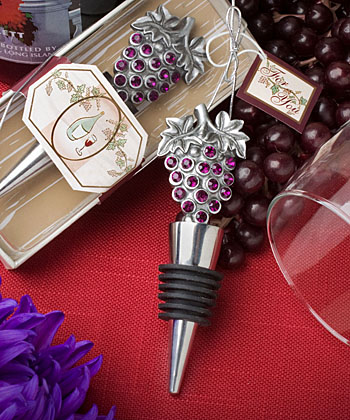 Whether you will be giving vineyard wedding favors bottle stoppers at your reception or as wine tasting favors, they will be a big hit with guests. 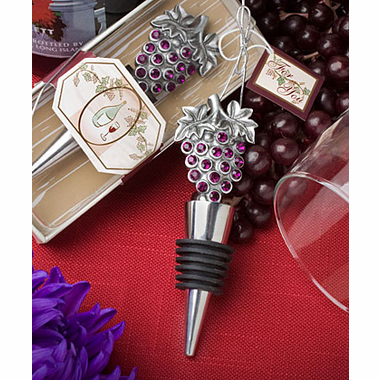 Each vineyard theme favor features a creatively designed, wine-themed chrome bottle stopper with a notable weight and quality. Atop the bottle stopper is an iconic bunch of purple rhinestone grapes with grape leaves. Each bottle stopper measures 4.25"H x 1.5"W and comes with gift presentation which includes a clear display box with wood print base and a general use "For You" tag.